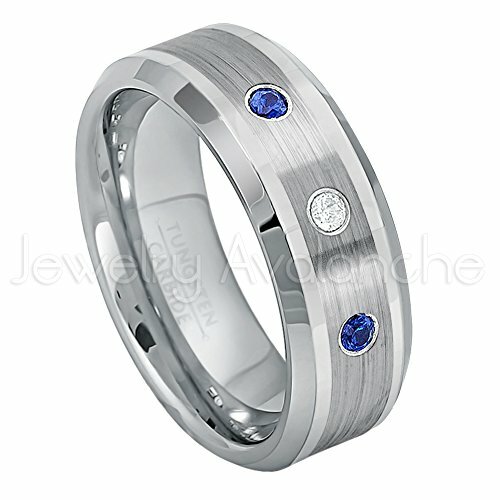 0.21ctw White Diamond & Blue Sapphire Tungsten Carbide Wedding Band. 8mm Polished and Brushed Finish Comfort Fit Tungsten Carbide Ring. Beveled Edge Tungsten Wedding Band. Cobalt Free Tungsten Ring, Engagement Ring, Anniversary Ring for her and for him. This is a CUSTOM MADE ring. Start off as plain ring; will be laser drilled & stone/s set on exact ring size you've specified. Please ensure you ordered the correct size. If you change your mind and/or NO LONGER WANTED the item you ordered, you have 7 days to return the item (after requesting a return authorization). A restocking fee of 35% will be deducted from the final amount. Product images on our storefront are for illustrative purposes only and color and tone of jewelry, diamonds & gemstones may and will differ from the actual product. These are not pictures of the actual jewelry, but rather a photoshop rendition of how they will look like. Actual product received & image displayed on your screen when you made the purchase will never precisely match. This is a CUSTOM MADE Ring. Please review our policy in the product description. If you have any questions about this product by Jewelry Avalanche, contact us by completing and submitting the form below. If you are looking for a specif part number, please include it with your message.